Fans are a fickle bunch. Fans of video games, infinitely more so. These guys aren’t above spittle-flying nerdly tirades on the Internet, so watch your darn step. If a series changes too much –or indeed too little– it’s like a minefield of abuse and/or poorly-spelled death threats via Twitter. Which is, all told, not fun. Spin-offs are also a controversial issue. How far can we take our favourite characters? Can we merrily plonk them into any genre we please, like the rebellious renegades we are? Sometimes we can, but only in rare cases can this be pulled off. Consider Mario, for instance. Nintendo’s moustached hero has been everywhere. Sports games, puzzlers, even an ill-advised cameo in Dance Dance Revolution. Then there was the time he tried his hand at a kart racer, and the rest is history. But that’s Mario; as long as he’s keeping Japanese businessmen in fancy suits and sensible haircuts he can do whatever he darn well pleases. His prolific career aside, this is partly due to the spin-offs’ great sense of familiarity. Because that inate Mushroom Kingdom-ness is brought so effectively to other titles, the world rarely feels out of place. It simply works. 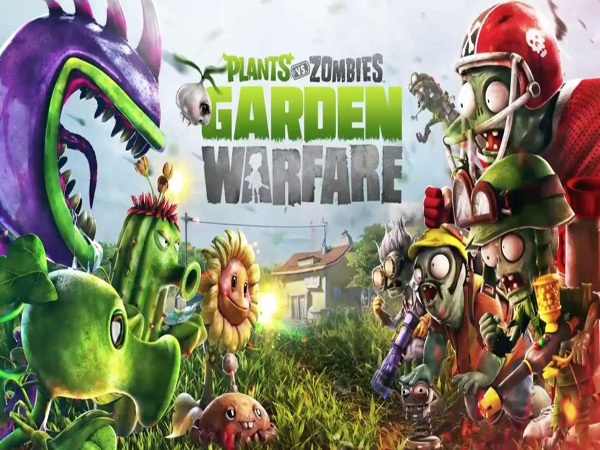 Which I think is the key to Plants Vs Zombies: Garden Warfare’s success. The game was released for Xbox One, 360 and PC earlier this year, with a PlayStation release coming later this month. It’s a third-person shooter, a different beast entirely to the Plants Vs Zombies we’re all familiar with. It brings all the typical PopCap crazitude you’d expect, with character classes made up of familiar plants from the original. Peashooters, Cacti, the Chomper and more are here, all ready to be dressed up in silly hats and shades for your amusement. Meanwhile, you can outfit your zombies in huge ridiculous viking beards, and charming accessories like a pencil up each nostril. So yes, tongues are firmly in cheeks here. Garden Warfare is the most toontastic and absurd shooter you’ll ever see. But this doesn’t mean it’s just a joke of a game. Beneath the surface are some rather solid shooter credentials. The classes themselves adhere quite well to genre norms. 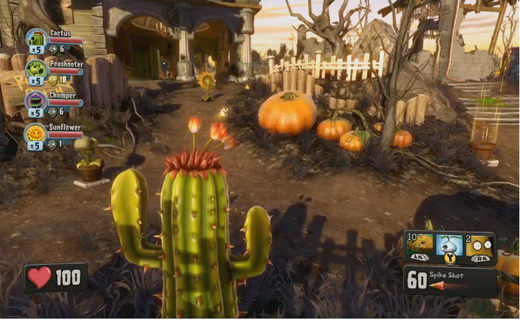 The Cactus is the sniper, armed with the proximity mines (potato mines) you’ll commonly see on the scout class. The frontline assault guy (here the All-Star zombie) has a short-range explosive to flush entrenched opponents out of cover, only here it’s a tiny imp that is punted at them. The game modes, too, are simply a Plants Vs Zombies spin on the familiar. Standard deathmatches, kill confirmed, objective capture, it’s all here. An hilarious title, there’s no denying, but it’s also rather a deep one. Fans of achieving little objectives to level up characters will find many, many hours of gameplay here. This is the tentative balancing act I’d say Garden Warfare achieves so well. Fans of the tower defense gem (which is, dare I say it, rather more casual) won’t be too jarred by this foray into a more serious-gamer genre. The transition is a gentle one. By the same token, TPS and FPS fans who have dabbled in Plants Vs Zombies (perhaps in a sort of elite, complete-survival-mode-on-the-hardest-difficulty-with-my-eyes-closed-and-one-hand-behind-my-back sort of way) can also appreciate the game. Much like Mario’s spin-offs, it’s firmly rooted –how’s that for a little wit-tastic straight to your delicate face– in the series’ universe, but it works.